About the book: WANTED: Pretend stalker. No experience required. Tall, dark, and quirky preferred. Sabrina is desperate to go to her dream college, but her parents want her to stay close to home. If she wants to maintain her perfect child image, Sabrina must break rules that even her rebel sister keeps. My review: Sabrina...Sabrina...I loved Sabrina in this book. She's just graduated from high school and she's ready to go to college. Only her parents have decided that she needs to go to Boise State because it's close to their home and cheaper. The problem being Sabrina wants to go to Caltech. She knows it's perfect for her intended major. Since she knows there is no way her parents will agree to let her go where she wants, she decides to get a stalker so that they will see she's not safe at home and let her go...I know, flawed thinking! That's where things get a bit crazy for Sabrina. Because she really doesn't have a stalker and she doesn't really know anyone that could pass for a stalker. So where else do you find a stalker but Facebook. And that's when she remembers Calvin, a guy she knew from high school who would be the perfect stalker, and he agrees to do it for a measly $50. But Sabrina doesn't count on the amount of lies she's going to have to tell about having a stalker. It was kind of sad the way Sabrina though of herself as an accident. She thought about it an awful lot because she mentioned being an accident several times. I loved that by the end of the story she saw herself in a bit of a different light, helping her confidence and self worth to grow and feeling that she really does deserve to be happy and live a good life. 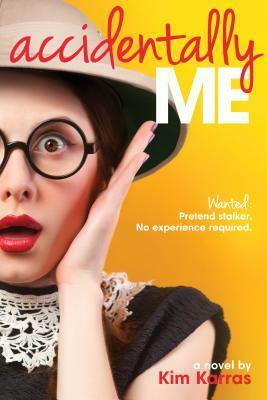 This is a cute young adult read that is clean and fun. I loved reading it!